The Micro-finance project in Tanzania has been helping disadvantaged women in Arusha for one year now with the aim of supporting these women in achieving economic independence through providing them with training and loans to set up businesses. The disadvantaged women who are benefitting from the Micro-finance project receive training from the volunteers in many business related areas such as bookkeeping, marketing and business, which helps them set up and make a success out of their business ventures. 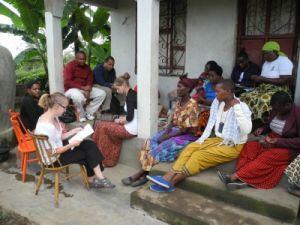 Over the past year, Projects Abroad has given loans to 46 women in Tanzania to start their businesses. An example of a success story thanks to the Micro-finance project is Anna, a woman who has 300 chickens and sells around 270 eggs a day. This successful business of hers was financed from a loan she received from the Micro-finance project. This project makes a real difference in the lives of the women who receive the training and loans; through a survey, the women indicated that working with Projects Abroad has improved their lives scoring life improvement an average of 8.5 out of 10.